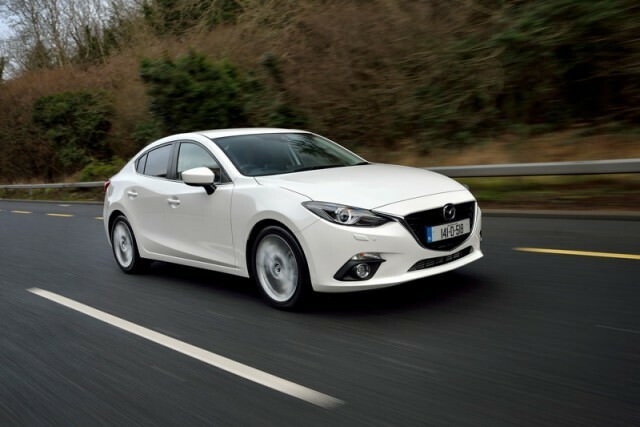 Attractive new Mazda3 saloon drives well, but is that enough? Buyers will be seduced by the gorgeous lines of the new Mazda3 saloon, and it drives as well as it looks, but its relatively high starting price and lack of a smaller diesel engine will keep it off many buyers' shortlists. The arrival of an all-new, high-tech Mazda3 should have sent ripples of alarm through the boardrooms of Wolfsburg, Detroit and Paris. Mazda has been really getting back into its stride lately, finding its feet in a post-Ford-ownership world and making hay (and not an inconsiderable profit) thanks to its clever lightweight, low friction SkyActiv technology. The nimble chassis and (supposedly) frugal engines of the Mazda6 and CX-5 have made both cars a critical and commercial success and bringing the same tech down to the Focus class should be setting Mazda up for success and rivals up for a fall. And it seems to be working. Mazda's sales in Europe in the past three months have been a full 25 per cent ahead of where they were last year, and in spite of an unfriendly Yen exchange rate, the company looks set to make a monster profit by the end of this year. Much of that performance is down to demand for the new Mazda3. Looking at it, that's perhaps not surprising. We are in an era when car design seems (as it did in the early nineties) to be converging on a few set points, but the 3 looks distinctive and different to its rivals. It's easy to mistake it for the larger Mazda6 from the front (same gaping grille and narrow, squinty lights), but around the back, things are very different. There's none of the conservatism of a Jetta or the uprightness of a Focus here - the 3 instead has a low-slung, tightly-wrapped shape. And while I think the five-door version is the better looking one, there’s no denying that the four-door saloon is also pretty. Space is good front and rear and out the back is a decent, well-shaped 419-litre boot. Can't wait to see what Mazda will do with an estate version of this, but that's perhaps for another day. All of Mazda's SkyActiv work has seen the weight of the 3 tumble to a relatively trim 1,320kg at the kerb (not bad at all, really) and that is the key to unlocking its dynamic potential. While it's a shame that Mazda probably won't bother making an extroverted MPS hot hatch version this time around, when you've tried the 2.2 diesel you may feel that aggrieved. First up is the steering, which feels beautifully weighted and precise. It's even quite good at feeding back the sensations from the road to your fingertips. It's no Lotus Elise in this regard, perhaps, but it's better than almost all its opposition and doesn't seem to suffer from the inconsistent weighting that blights its bigger brother, the 6. Where things start to fall apart a bit is on the engine front. Now, the 2.2 SkyActiv diesel engine is a thing of engineering wonder, running as it does an unfashionably low compression ratio for a diesel, being made of light materials in a light manner and generally being excellent to use. Certainly, the first time you hit the crest of its 380Nm torque wave in third gear, you will forever eschew the hordes of down-sized 1.6-litre diesel rivals. There really is no replacement for displacement, and that just underlines the lack of a need for a hot-hatch version of the 3 - why bother when the standard diesel is this good to drive? The fact that it's also creamily refined helps not a little. The problem is with its fuel consumption. The whole point of the SkyActiv programme has been to drive down consumption and emissions and therefore make Mazdas more appealing in a cost-and-carbon-conscious world. The headline combined fuel consumption figure of 4.1 litres per 100km (68mpg) looks extremely good, but the sad fact of the matter is that, no matter what we tried and no matter how we drove, we just couldn't get the 3 to budge from an average of around 6.0 litres per 100km, or 47mpg. OK, so that hardly makes it a Dodge Viper when it comes to fuel consumption, but it is disappointing in almost any mainstream diesel car these days not to break the 50mpg barrier in day-to-day driving and doubly so when Mazda has made so much publicity of its SkyActiv technology. To put it in context, driving a bigger, heavier, less high-tech 2.0 TDCi Ford Mondeo we scored an almost identical average consumption figure. There are other issues and the most pressing one is price. Yes, there is an awkward Yen-Euro exchange rate at the moment but Mazda is going to have to do something to bring its headline prices down a bit. There is truth in the argument that the 3 is better specified as standard than rivals and that the likes of a Jetta or Focus would be much more expensive if you ticked all the options boxes to bring their equipment up to the same level, but it's the headline price that most people see and that's a problem. There's also an issue with refinement as the 3 generates just a bit too much road and tyre noise for comfort, especially on a longer journey (admittedly in the well-endowed - in the tyre sense - GT and Platinum models). Now, let's put all that in context. There's no doubt that in terms of dynamics, looks and quality, you could make a convincing argument for the 3 to be the best car in its class right now. It is held back by two things; its price, which looks too high relative to a Jetta or Focus, or most especially a SEAT Leon or Peugeot 308 when considering the hatchback version; and its fuel consumption, which is just too high for a car purporting to be an efficiency king. Hopefully, Mazda's forthcoming 1.5-litre SkyActiv-D diesel engine will rectify both issues - bringing down the price and driving down the fuel consumption. Until then, the 3 remains just tantalisingly short of the class best. Ford Focus saloon: can't match the Mazda's diesel engine or cabin, but in handling terms it's neck-and-neck. Toyota Corolla: more spacious and has a great reputation, but only diesel is a rather pedestrian 1.4-litre. Volkswagen Jetta: 2.0 TDI has the Mazda beat for economy but it hasn't the style or the chassis to keep up.